Last week, I went to New Orleans for the first time. A few days and a couple pounds later, I regretfully had to return home. What made this so good is that it didn't try to get too fancy. 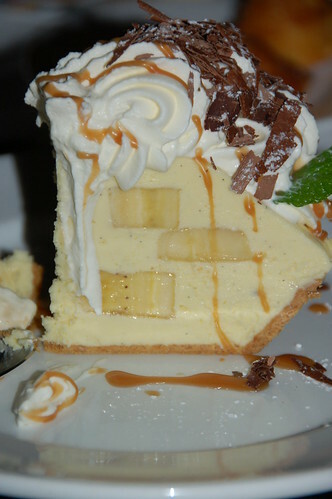 Graham cracker crust, bananas in a creamy filling, whipped cream, a drizzle of caramel sauce, and some chocolate shavings. I was a little dubious at first about that chocolate—would it taint the delicate flavors of the banana and cream? Nope. The thinly shaved chocolate added just a light, pleasant accent without turning the whole dish into a chocolate-banana pie. Even after appetizer, drink, and an entree, I had no trouble finishing a pretty decent size piece of pie. So, fine, I admit that isn't all that unusual for me, but really I didn't even consider stopping when I felt full. Every last bite of that pie was going down the old, well, pie hole. I have to say, the entire dinner at Emeril's was great. You never quite know what you're going to get with a celebrity chef restaurant, but this one lived up to the hype.